Day 2 of the sugar detox is officially over! No major cravings yet, but I’m bracing myself for days 3-5. I hear those are the tough ones. After a long day of filming a cooking video at work and meeting with a group of ladies from church after, I was exhausted and didn’t feel like cooking. Luckily, this dish is healthy and comes together quickly. To make perfect, juicy grilled chicken breast, start by pounding it out nice and thin. Doing this will help it cook evenly. Next, place the chicken breast in a ziplock bag with salt water (about 1 tbs salt for 1 cup water). This will further tenderize the chicken breast. Allow it to soak for about 5 minutes, then remove and pat dry with paper towels. Preheat your grill, grill pan, or foreman. If you want to keep your grill clean, seal the chicken breast in an aluminum foil packet with your favorite seasonings. 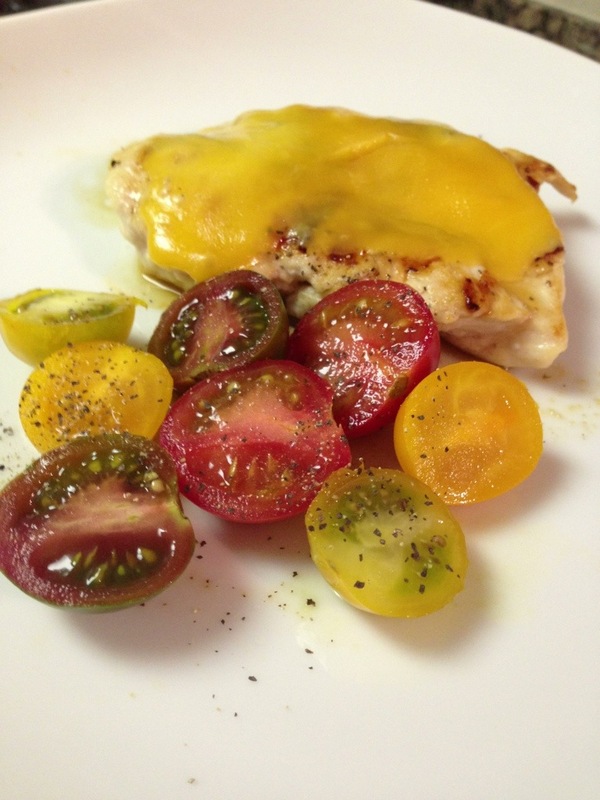 I served my chicken with some cheddar cheese and a side of baby heirloom tomatoes. It’s amazing how sweet tomatoes taste after just 2 days of cutting back my intake of sweet foods! Enjoy!